Will MBAs ever be good at Digital Marketing? Digital marketing is now one of the few business disciplines that senior executives often mismanage totally. On February 21, I’m speaking about digital marketing to graduate students at Manchester Business School. It’s Britain’s biggest business school, with campuses in Miami, Rio, Dubai, Singapore and Shanghai, and which Forbes recently ranked as having one of the world’s two top international MBAs (I’m an alumnus of both MBS and the other top school, in London). They are destined for fast-track management roles, often in finance, consulting, pharma and tech. Manchester has one of the few US-style MBAs in Europe, with five taught terms and an intensive summer session making a long and extensive process. The MBAs I’ll be speaking to are interested in marketing, entrepreneurship and in the telecoms, media and technology industries. All of these sectors have been changes massively by digital technologies. The traditional media, for example, have been greatly eroded by the accessibility and immediacy of social media. 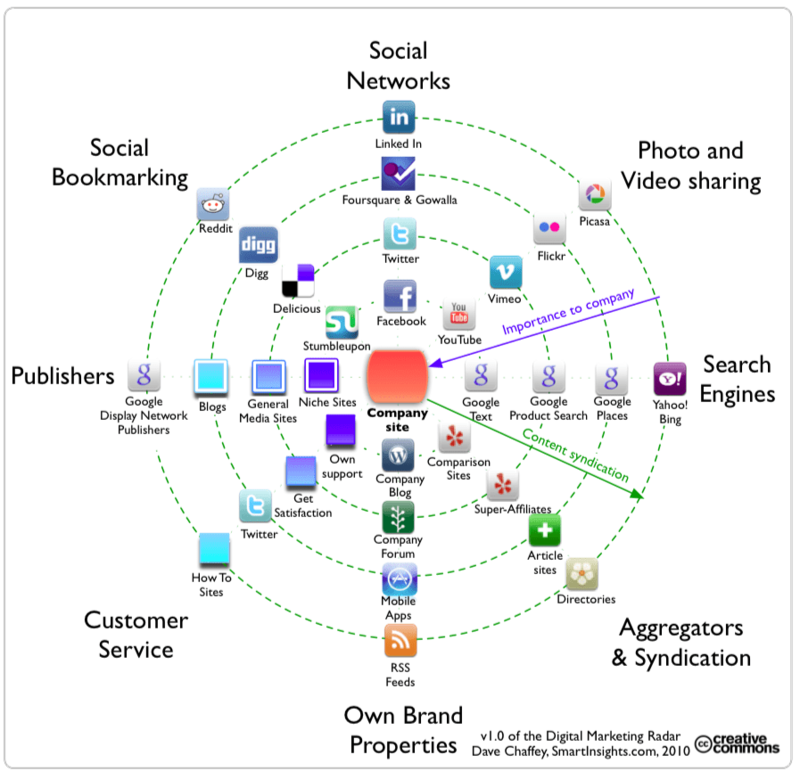 I’m a big fan of the Digital Marketing Radar approach, not the least because it’s a Creative Commons approach that can be developed by others. It’s been developed over the years, but I think the original version shown here is still the clearest graphically, not the least because it shows that owned media are most important to companies while syndication pushes the message out. Digital marketing is a great idea. But don’t forget the human touch as well when your customers contact you. It’s also very important for social media to be human, and for the messages to identifiably come from people. Research a bit about your target audience to find out what’s hot in their area in digital marketing, and brainstorm from there. Big data is one thing that comes to mind but there could be many others, depending on your audience. PPC search engine advertising has been so much more successful than old-style PPM. I’d question whether Google is as innovative as they’d like you to think, given that such a large proportion of their revenue comes from PPC advertising (not their idea and they don’t own the IP). I’d talk about the growth of mobile and the different ways in which people use smartphones/tablets versus PCs/laptops. Digital marketing needs to be aligned with the wider digital strategy and not be a silo operation of the marcomms function. If a Co has no coherent holistic digital strategy DM is simply flash bang. Metrics would be the other one… knowing what to measure and how to use those metrics and what metrics are just that… metrics…. What frightens me slightly sometimes is that digital is almost to important to sit in marketing (and I work in marketing!). IT needs to get on top of this one a bit more otherwise the train is leaving the station without them. IMHO. What are your thoughts about what MBAs need to know about digital marketing?